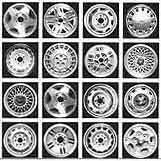 alloy wheels, rally wheels, and plain stock wheels. We'll keep your car or truck rolling right! ACURA, AUDI, BUICK, BMW, CADILLAC, CHEVROLET, CHRYSLER, DATSUN, DODGE, FORD, GENERAL MOTORS, HONDA, HYUNDAI, INFINITI, ISUZU, JAGUAR, JEEP, LEXUS, MAZDA, MERCEDES, MITSUBISHI, MUSTANG, NISSAN, OLDSMOBILE, PONTIAC, PLYMOUTH, PORSCHE, SUBARU, TOYOTA, VOLKSWAGON, and VOLVO, and many more! We only sell "original" wheels--the ones that came on the particular car or truck from the factory when it was new (e.g. if you have a Ford, we have the wheel Ford made for your car, if you have a Toyota, we have everything Toyota builds and built). then please sell us your factory originals! Repaired Wheels, Rebuilt Wheels, Refinished Wheels, Refurbished Wheels!